Today Jeff and I are heading to Las Vegas!!! We booked a last minute trip to go with Jeff's dad and his *new* fiancee (they got engaged on Christmas Eve!) and I'm super excited about it - we're planning on doing a little gambling, a little spa-ing, and a whole lot of eating and drinking ;) We ended up booking a gala dinner for New Year's Eve, which means we'll be ringing in the new year with a tasting menu, lots of champagne, dancing, and fireworks. I typically don't like NYE, but I think the plans we made are basically the perfect way to do it. I'm currently packing up the cute little suitcase I gifted myself for Christmas with everything sparkly in my closet, and signing off until the new year. I won't be posting on Monday because I plan on really sleeping in, but I'll be back on Tuesday with my big budget recap for the year. See you then!!! It's the end of another year, so here are some of my favorite looks from 2016. It's funny having this record of everything I wore this year. There were a lot of outfits I still love, and also some I would definitely never wear again. And lots where I'm having some interesting hair days ;) It's like having a visual diary, I can look back and remember what I was doing on each of these days and where I was. Here's to a great 2017! P.S. Favorite looks from 2015, 2014, and 2013. I hate to say this, because it starts to get redundant when I repeat myself every month, but holy crap, how did we get to the end of December already? And for that matter, the end of the year?! I was looking back through my budget posts for the year to prep for my big annual clothing budget recap post (coming next week!) and realized I was way under budget for the year, so I decided to loosen the purse strings a little this month and went a bit over budget. Really, I would have been close, except that I saw this adorable Vineyard Vines plaid dress and had to have it for Christmas. I only wore it a couple of times, but I’m sure it’s going to be a staple for many Christmases to come. Another purchase I was really excited about are these Coach riding boots. Chicago is supposed to be really cold this winter, and I realized about three days into December that my ankle boot collection was not going to cut it this year. I’m still breaking them in so they aren’t quite as comfy yet as my go-to riding boots that have been around for years (which I somehow managed to wear for a three mile walk through the Loop, River North, and the Gold Coast yesterday! ), but I’m pretty sure they’re going to get there. A word of warning - these definitely have a super narrow calf (here’s the wide calf version if you need it). They’re snug on me and I never need wide calf anything. Vineyard Vines Dress - originally $198, on sale $148.50. Coach Riding Boots - originally $265, on sale $158.90. Gap Jeans - originally $89.95, on sale and used rewards $33.18. Sole Society Studded Heels - originally $69.95, on sale $59.46. Charming Charlie Bow Earrings - $10. BaubleBar Tassel Earrings - originally $32, on sale $22.40. J. Crew Factory Striped Tee - originally $34.50, on sale $13.50. So, like I said, a bit over, but I’m facing a surplus for the year overall so I’m not feeling bad about it. I’ll share my thoughts on my purchases for the year next week, but for January at least I’ll be shopping for pieces that feel a little more special. 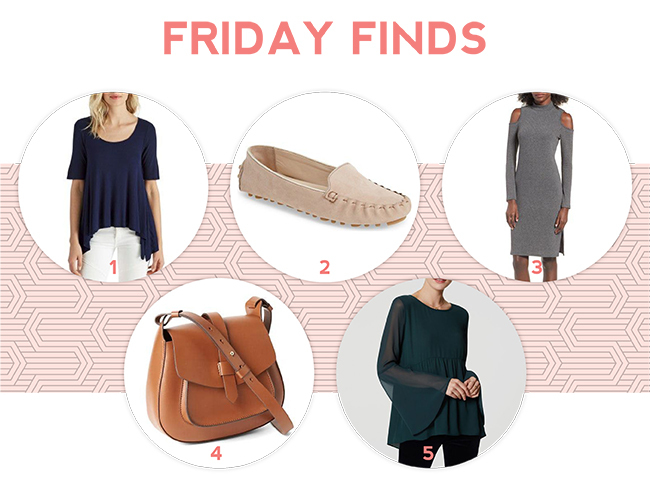 This year I’ve gone crazy on basics, which are all great things to have, but I feel like I’m lacking things that are exciting in my closet. I want a couple of things that I’m really excited to wear, for date nights, parties, and when I need to dress up a little for work. So tell me, did you budget in December? How did you do? On Thursday we drove up to my parents' house to go to a party at our neighborhood friends' house. We get together for a theme party and some aggressive games every year and it's always so fun. This year the theme was Vegas because a bunch of us are heading there for New Year's Eve, so the games involved a lot of gambling (and quite a few allegations of cheating ;) - Jeff came away as one of the winners this year! On Friday after we drove all over the suburbs trying to finish up our Christmas shopping, Jeff and I decided to have a little Christmas date night at home. We opened a fancy bottle of wine, changed into Christmas pajamas and piled on the blankets, put on "It's A Wonderful Life," and exchanged gifts. So, you know, basically perfect. On Saturday we drove up to my parents' house again for Christmas Eve with my mom's family, which every year includes a gift exchange with a whole lot of shouting ;) My gifts got stolen over and over, but I wound up with a new little cactus to bring home. On Sunday we spent Christmas morning at my parent's house with my sister's little family. Christmas morning with my eighteen month old niece was so cute. I mean, she was mostly interested in collecting everyone's tissue paper and running around with all of the gift bags, but she also got so excited about some of her presents. We got her the cutest little baby doll, and she could barely wait for her dad to take it out of the package. Sunday afternoon we drove down to Jeff's mom and stepdad's house to celebrate with his family and stayed the night out there. Between the seven of us we managed to exchange three copies of Settlers of Catan, so we ended the night with a pretty intense game - I managed to pull out a win! Whew! That was a lot huh? Also, somewhere in there Jeff's dad managed to get engaged! I haven't heard all of the details yet but we're planning on celebrating next weekend in Vegas!! Okay you guys, so I know that this weekend is Christmas, but that means that NYE is just a week away! I don't know about you, but every year New Year's Eve sneaks up on me while I'm busy wrapping presents and baking cookies and then I realize I have nothing to wear. Jeff and I were planning on keeping things casual this year, that is, until we ended up agreeing to a trip to Vegas - cue the glitz and glam!! I love a good excuse to dress up since Chicago is so casual, so I'll definitely be pulling out all the stops. 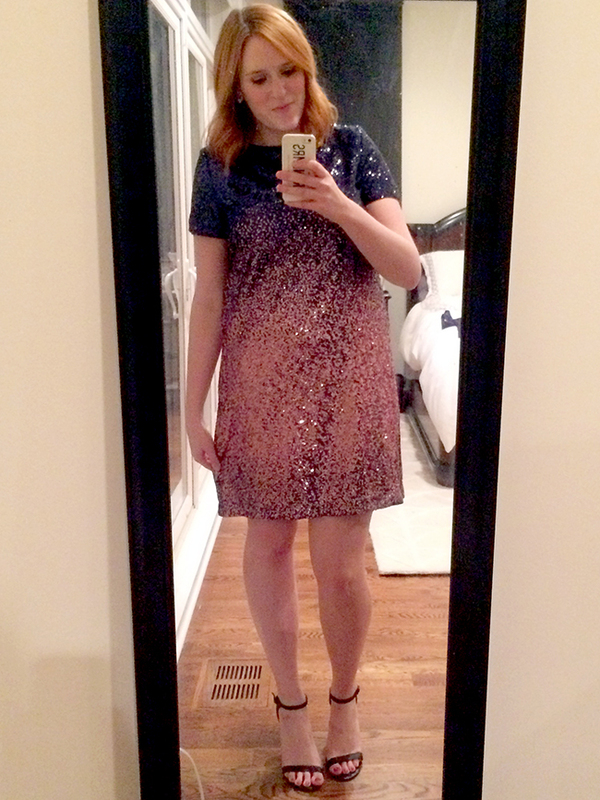 I'm planning on pulling out all of my oldies out of my closet, like this pretty sequined number I wore last NYE. If I had more money in my budget for December and hadn't already gone a hundred dollars over (whoops!) 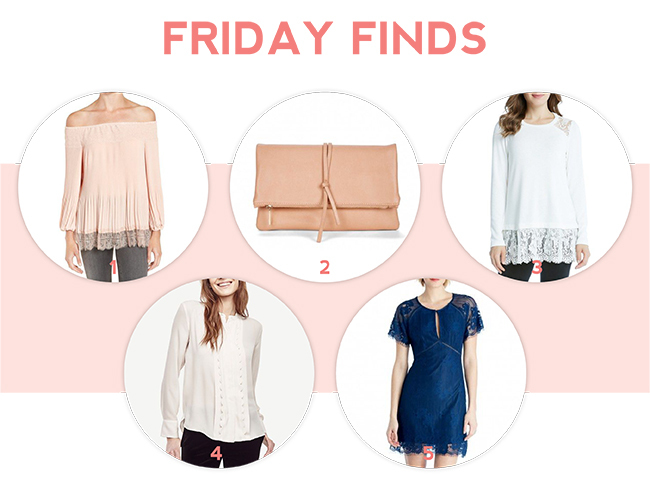 I would maybe be shopping for something new - here are a few of my favorites! So tell me, do you have big plans for New Year's Eve? What are you going to wear? 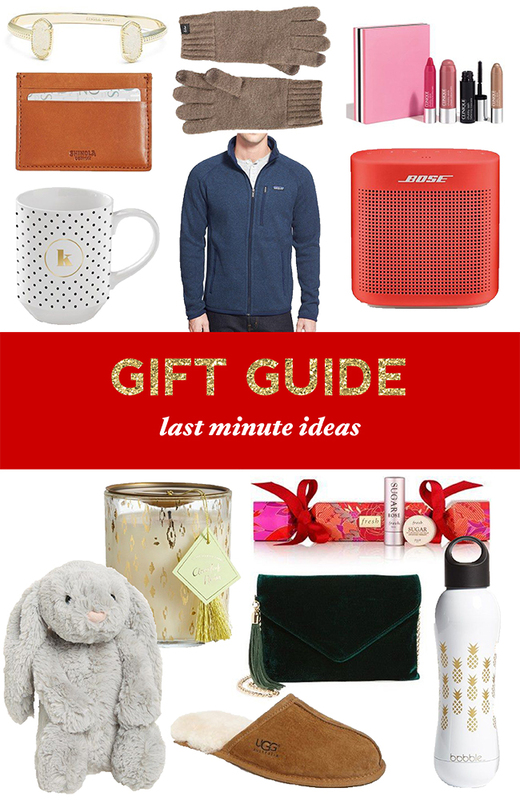 Have you been procrastinating on your gift buying this year? Every year I find most of my gifts pretty fast, but then stall on the last few and end up in a panic trying to get everything on time. This year I really struggled with Jeff, I finally ordered it and his gift is juuuuuust supposed to make it on time. 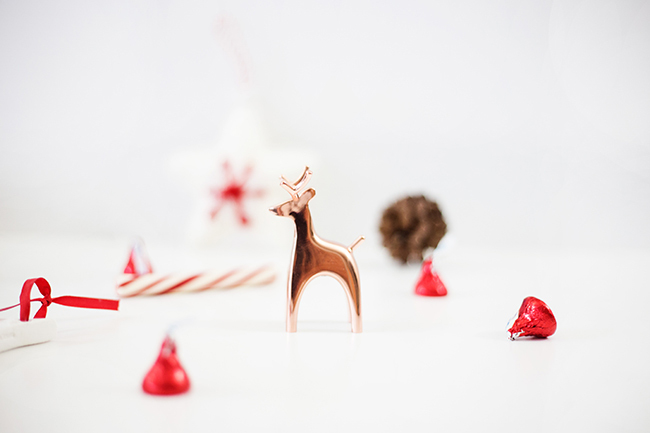 If you're looking for more gift ideas, here are stocking stuffers, gifts for the hostess, gifts for the mixologist, gifts for the couch potato, and gifts for him. Omg you guys. This dress. It was way over my usual budget for a single clothing item, but I saw it and couldn't get it out of my brain, so I decided it was meant to be. Unfortunately it somehow already went out of stock (I just ordered it last weekend!) but I linked up a bunch of other fun holiday dresses in case you're looking for something last minute to wear. Since Christmas is somehow THIS WEEK (what?!??) I plan on wearing this dress basically nonstop for the next couple of days, including to my father-in-law's Christmas party on Wednesday and on Christmas Eve. I'm so excited for the next couple of weeks. We also have a party with my neighborhood friends from home which is hilarious every year on Thursday, a couple of nights spent out in the suburbs with my family and then Jeff's, meeting TWO of my cousin's new spouses, and a whole lot of time visiting our extended families. I wasn't planning on taking a lot of time off for the holidays this year, but my boss ended up offering me some extra vacation days for working a huge event earlier this year. Combined with floating holidays and the days our office is closed, I somehow managed to end up with time off from this Thursday all the way through until the new year! I think I managed to trick Jeff into taking some days off too, so I'm planning a bunch of day dates for us, including brunch at Cindy's, a trip to Millennium Park to see the big tree, and a visit to the Science and Industry Museum. We also ended up planning a last minute trip with Jeff's dad and his girlfriend to Vegas for New Year's! I'm so excited!! Right now we have tickets to a fancy party for NYE, and I'm planning on sneaking away for a little spa time and shopping while Jeff and his dad hit the craps table. Two of my good friends from home are going to be there at the same time so we're also planning on meeting up with them. I seriously can't wait!! 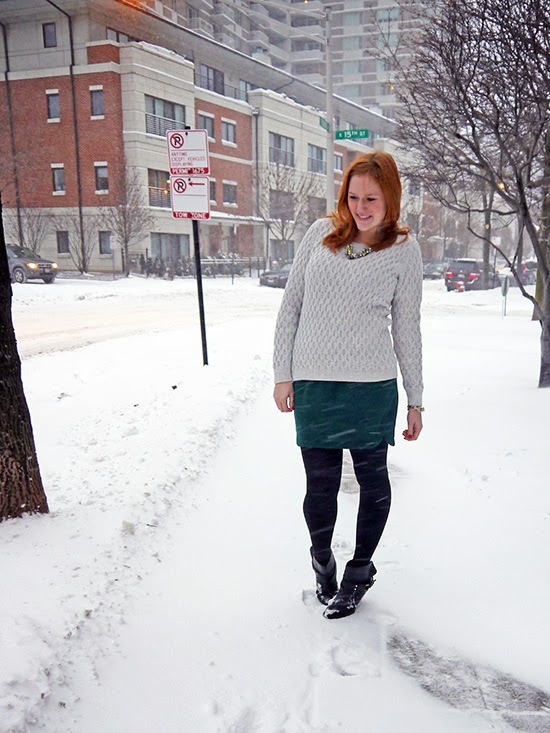 Linking up with Style Me Wednesday, Trend Spin Linkup, Style Sessions, Confident Twosday. ...Went to my company's holiday party, which was huge and crazy. It was black tie down at the Field Museum, so a couple of my coworkers and I decided to go all out - how often do you get to dress up for a fancy party?! We went and got our makeup done (which you may have seen on Snapchat - follow @kristinadoes), and I wore this gorgeous gown I rented from Rent the Runway. It was snowing like crazy and the Uber prices were so high (like, $85 high) so we decided to drive at the last second, so we didn't go too crazy, but we did get in a little dancing to Sixteen Candles, our favorite cover band in Chicago. I hope you had a good one! We have a crazy week ahead filled with parties and family time, and I can't wait. Can you believe Christmas is less than a week away?! Happy Friday! We've got a particularly crazy weekend ahead. Tonight is my company holiday party, which is black tie! I haven't been to anything black tie ever, you know, besides the prom. I ordered this dress and this incredibly similar dress as a backup from Rent the Runway, so one shoulder or the other is going to be partying tonight. Then tomorrow we're heading out for a friend's wedding. Don't you worry, my dancing shoes are polished and ready. Well, not actually polished, because they're suede, and that would be very bad for them. I've been staring at this plaid dress for days and days trying to talk myself out of wanting it. It was on sale though and there was only one left in my size, so it ended up in my cart while I was putting this post together. Whoops. I did discover that I'm almost $600 under on my clothing budget for the year though, so I don't feel too bad about it. I have big plans for this little dress, with its debut at a holiday party on Wednesday and then again for Christmas Eve - fingers crossed it fits! I'm basically burrowing myself under all of the faux fur in our condo and not coming out again until spring. Oh, and outfit photos? Yeah, not sure how I'm going to be accomplishing those this winter if this weather keeps up! We took these photos last weekend when I convinced Jeff to leave our house and go for a little walk in the snow. I thought we'd find some untouched, pristine snow in the park near our house, but forgot that of course a hundred dogs had already torn through it. It was still beautiful, and the temperatures still bearable, so we chased each other around through the snow for a bit before coming home to hide on the couch for the rest of the weekend. To make it through cold weather, I have a few staples in my closet. The first are these Joan of Arctic boots. They're a bit clunky so I don't pull them out until I need to, but the huge size, faux fur and rubber soles are perfect when its cold and snowy. I often wear two pairs of socks with other boots in the winter to keep my toes warm, but that's unnecessary with these! Another staple for me is a big blanket scarf. This one is technically a wrap, but works really well as a scarf too. It wasn't so cold over the weekend, but when it is (um, you know, like today) I love being able to wrap a big blanket scarf all around my face to stay extra warm. Another essential in Chicago is a big puffer coat. 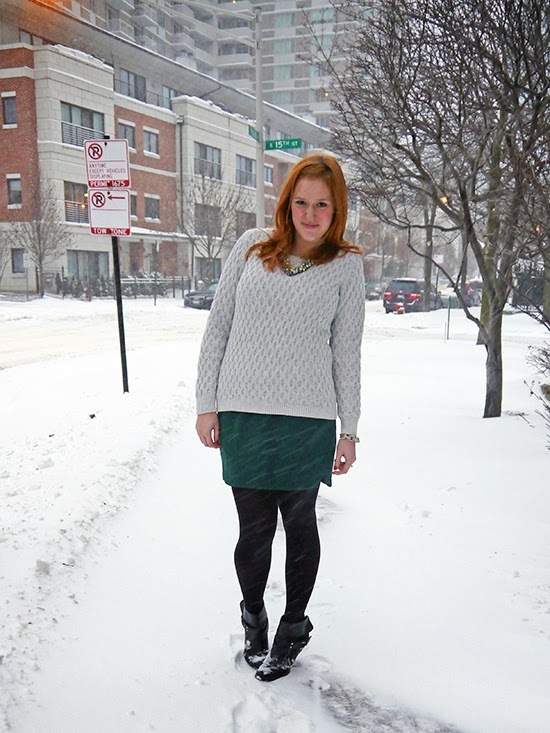 They may not be the cutest, but there's no way you're making it through a Chicago winter in just a wool coat. I'm still dreaming of owning a Canada Goose some day, but until then this puffer will do. When buying a puffer I look for details that make it a little more fashionable, like fur trim and some definition around the waist that helps me not look like a giant marshmallow. So tell me, is it cold where you live? 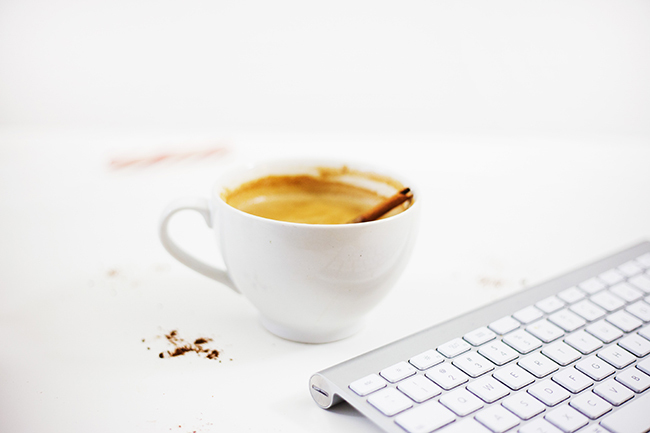 How are you getting through the winter? Linking up with What I Wore to Work.